Traffic's been halted on the M25 between J27 and 28 after a cow was spotted near the hard shoulder. Highways England tweeted a picture of the animal and said they're working to make the area safe. A new report commissioned for the Government has found that the 'rush hour' for drivers using the M25 can actually last from 6am to 6pm. The finding is a surprising one to many, but some transport campaigners say that people who use the M25 already know that there is a lot of traffic on the route. The Department for Transport says that it is spending a lot of money on improving the south's major routes. “We are investing £15 billion up to 2020 delivering upgrades to motorways and major A-roads. A dad-of-two has revealed how he was almost decapitated when a brake disc of a HGV snapped off and came hurtling through his windscreen. 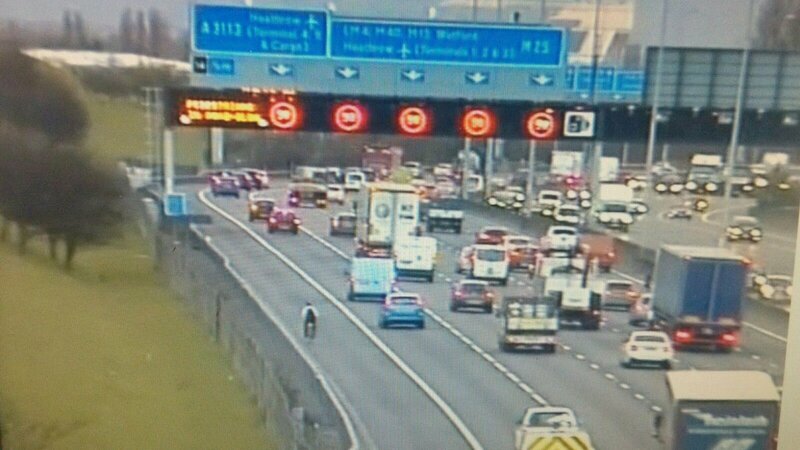 Cyclist pulled over by police on M25! Driver are being warned of long delays on the M25 at Kent following a crash involving a lorry and a car. Police were called at 3:46am to a report of a road traffic collision on the clockwise M25 at junction 2. The car and lorry collided then the car hit the central reservation. One man in the car has suffered serious injuries. Three further people have suffered minor injuries. All have been taken to hospital for treatment. The clockwise carriageway remains closed while officers continue their enquiries. Professor Malcolm Green, from the British Lung Foundation, said that the latest report about pollution levels on the M25 were worrying. A section of the M25 through Kent has been identified as having some of the highest levels of toxic gases in the country. There are more delays on the M25 this morning. There are problems both ways between J13 and 15 in Surrey. There is also congestion clockwise between J9 and 11. In Essex, there are hold-ups at the QE2 Bridge. Highways England CCTV cameras show that the M25 is at a crawl. Interview with Mark Hallett of the traffic control centre at Godstone.